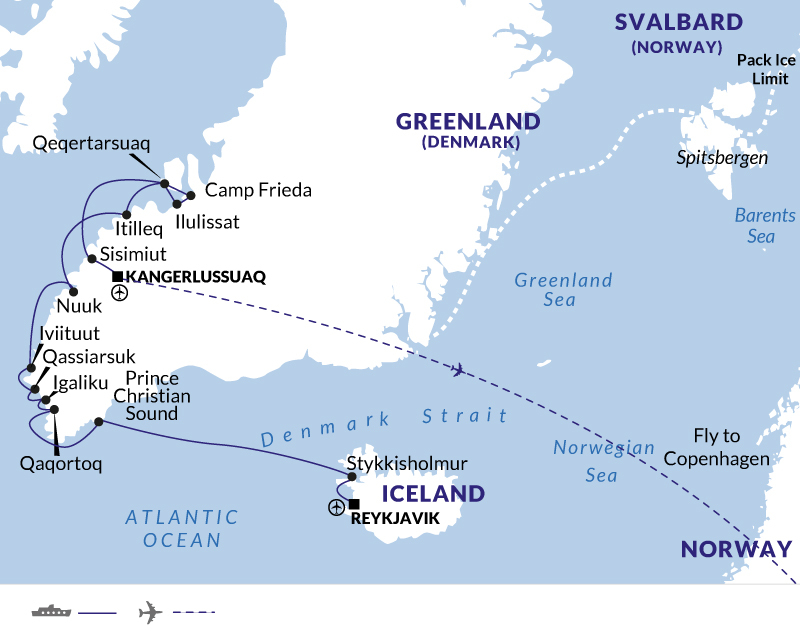 Discover the Arctic highlights of Iceland and Greenland and visit historical sites from the Viking era. Mythical Iceland impresses with its diverse landscapes and teeming birdlife, while Greenland offers true wilderness. Explore southern Greenland and the Disko Bay area - also known as the heart of the nation, on the western coast of Greenland. Enjoy spectacular scenery and fantastic fjords, all under the light of the midnight sun, providing a stunning backdrop to this expedition. Reykjavik is Iceland's capital city and referred to locally as the smallest big city on Earth. In relative close surroundings of the city you may find glaciers, waterfalls, geysers and mountains. The MS Fram will depart in the afternoon. As we reach the west region of Iceland, you will understand why this area is dubbed The Sagaland. Take your time to explore Stykkishólmur's diversity with lava and rock formations, glaciers, volcanic activity, and hot and cold springs. Participate in a range of exciting excursions such as kayaking and hiking. We leave Iceland behind and sail across the Denmark Strait to reach Greenland. The Denmark Strait connects the Greenland Sea to the Irminger Sea. This crossing was used by the Vikings to migrate from Iceland to South Greenland some 1,000 years ago. They calculated their distance to land by tracking the direction of flight of sea birds. Prince Christian Sound, located nearly at the tip of the huge island, separates mainland Greenland with Sangmissoq and other islands of the Cape Farewell Archipelago. We sail through this narrow channel and enjoy the spectacular scenery here. The sound itself is around 100 km long and very narrow, sometimes only 500 metres wide. This long fjord system is surrounded by steep mountains, some more than 1,200 metres high. Enjoy the sight of glaciers calving icebergs straight into the ocean from the deck. If the channel is blocked with ice, we will sail around Nunap Isua - Cape Farewell. Come ashore on the uninhabited island of Uunartoq. This small island is blessed with natural hot springs warm enough to bathe in. Scattered around the island are a number of pools fed by hot springs bubbling up from the ground below, keeping the water temperature a balmy 34-38 degrees, even during the freezing winter. The springs are set in a completely natural environment, in the middle of a grassy field, surrounded by mountain peaks and drifting icebergs. Soak in the warm water and enjoy the beautiful natural surroundings. Many consider Qaqortoq one of the most beautiful towns in Greenland for it's array of colourful houses. The excursions on offer here include an interesting visit to the only tannery in Greenland, a city walk with guide, and a kaffemik to meet the locals and share a traditional open-house coffee. Igaliku is one of the most beautiful villages in Greenland. This is the oldest sheep farming settlement on the island, and on arrival you will see tall mountains with peaks covered by snow during summer, lush valleys with flowers and, of course, sheep. Sandstone houses give a distinct flavour to the area, as does the stunning view to the Igaliku fjord. Experience the tranquillity and peace of this historic settlement. Christianity was introduced to Greenland at the turn of the last millennium, with the first bishop being appointed in 1124. The impressive episcopal residence Garðar was established shortly after that date in Igaliku. A cathedral was built, the biggest of all churches in Greenland in the Middle Ages. For many years, the bishop's palace was a focal point for the Norsemen and visitors from Iceland and Norway. The ruins of the cathedral and the bishop's palace have been renovated during recent years and today make up an attractive relic of the Viking period. In Qassiarsuk you will find green fields dotted with white sheep, lush vegetation and busy farmsteads; all this forms a colourful contrast to the icescapes at sea. Qassiarsuk is also where Viking Erik the Red built his Brattahlíð estate in 982 A.D. He was banished from Iceland and escaped to the land he called Greenland. Erik settled in Qassiarsuk because the area was considered the most fertile place in Greenland when he arrived. Join a guided walk through the settlement, where you will learn more about the history of the region. You can visit the reconstruction of Erik's longhouse and the church that Erik's wife Tjodhildur made him build. The walk will include a visit at the town's current church. This is also a great area to try optional activities such as kayaking, hiking, or exploring the town on foot. Nuuk is the oldest town in Greenland and is situated at the mouth of one of the largest and most spectacular fjord systems in the world. Today this is where old and new traditions meet, from picturesque historic buildings in Kolonihaven to the centre for Greenland Home Rule. Being the capital, Nuuk also houses a university, a teachers training college, churches and the Greenland National Museum - home to the mummies from Qilakilsoq. Itilleq means the hollow and as its name suggests, this small settlement is situated in a hollow, majestically surrounded by high mountains and glaciers. Around 130 people live here, mainly engaged in hunting and fishing. The island has no freshwater and for this reason, Itilleq makes use of a facility for creating freshwater from seawater. The church here has an interesting history: It was built in Thule Umanak- North Greenland in 1930 and it was moved to Itilleq in 1963. Itilleq can truthfully be called the Arctic Circle Village, as the Arctic Circle is indeed found only 200 metres to the south. We will visit a location near Saqqaq, around 70°N, 51°W, that was without an official name until 2013. The place has special significance to Friederike Bronny, one of the Expedition crew. As a young geology student, she spent a year in a tent in this small valley. She also visited the spot several times later as an Expedition Leader. A few years ago, MS Fram was planning to land here and the captain needed to inform the authorities. Unfortunately, this particular site didn't have a name. So the captain said, \ At Hurtigruten we call it Camp Frieda. Not long after, the authorities relayed that from that moment on, Camp Freida would be the official name of the position. Ilulissat is set in the stunning scenery of the Ilulissat Icefjord. The area was added to the UNESCO World Heritage List in 2004. Just outside the town, at the mouth of the fjord, you can often see enormous icebergs that have run aground. They originate from the Jakobshavn Glacier, one of the most productive glaciers in the Northern Hemisphere. These mighty icebergs are unique - no two are alike. Marvel at the changes in hue of the ice - from white and blue to shades of orange and red - when the iceberg surface is struck by the midnight sun. Hear the icebergs\ soundtrack of cracking and rumbling, as the sounds echo from one end of Ilulissat to the other. We offer a variety of optional shore excursions such as hikes, historic town walks and a boat tour to the Icefjord. Qeqertarsuaq is the only town situated on the volcanic island of Disko. Greenlandic legend says that two seal hunters were annoyed that the island stood in their way. Using a single hair from an infant, they towed the island up north behind their kayaks. A witch in Ilulissat did not like this lush, green island approaching, and cast a spell on it to run aground. This verdant island in the midst of ice, offers amazing Arctic experiences. Join optional excursionssuch as a guided town tour, kayaking or an ice-cruising boat trip. If you like archaeology and history, you should definitely pay a visit to the local museum or stroll around the settlement on your own. Sisimiut is situated 40 km north of the Arctic Circle. The name means the people living in a place where there are fox dens. This is the second largest town in Greenland, a modern settlement that maintains ancient traditions. Our optional shore excursions include hikes, boat trips and sightseeing. You can also watch local artists sculpt jewellery and crafts from bone, leather and metal, or taste Greenlandic specialities in a local restaurant. As we reach Kangerlussuaq, your expedition aboard the MS Fram comes to a close. After disembarkation, you will join a final excursion towards the Greenland Ice Cap, to the Reindeer Glacier. This vast icy wasteland stretches 1,500 miles north and reaches heights of up to 3,200 metres above sea level. The road to the edge of the Ice Sheet boasts beautiful natural scenery, ranging from Arctic desert and tundra with low growing shrubs, to hilly terrain offering breathtaking views over the landscape. Enjoy a barbecue meal before we transfer you to the airport for your late evening flight to Copenhagen. You arrive in the Danish capital early in the morning and may even have the time to explore wonderful Copenhagen, before you head home. Due to Denmark's location in the middle of several seas, the weather is mild and the climate temperate year-round. Additionally, Denmark's day and night temperatures don't fluctuate that much. Summer time is from May to August with the temperatures often reaching the low 20°C. May is a lovely month to go as spring is at its height. Winter is from December to March with periods of frost and darker days with average temperatures of 0°C. Whilst landings are included in the cost of your trip as per the outline itinerary, there are many optional excursions available on your voyage that can be pre-booked with the ship operator directly. These will be charged at an additional fee, depending on the excursion, and we recommend booking these in advance to ensure availability. Please speak to a member of our Polar team who will advise you on the booking process. The tour leader will advise. We recommend that you take mixture Danish Kroner and Credit Cards with you. ATM's are widely available usually located outside banks, supermarkets and shopping centres. Most cash machines are available in different major European languages. It is free to withdraw money if you are using a cash machine from your own bank, though you may have to pay a transaction fee if you withdraw cash from a different bank. MasterCard or Visa cards accepted except in some supermarkets and small shops. American Express and Diners Club are also accepted, though not as widely as the previous two. With credit card payments made in Denmark you should expect to pay an extra charge. We do not recommend that you use travellers cheques as they can be difficult to exchange. Nothing compulsory though we recommend protection against tetanus. Tick-borne encephalitis is recommended by some medical sources if travelling in certain areas of Europe, at specific times of the year. Please check the latest requirements with your travel clinic or doctor prior to departure. The above is not an exhaustive list. Further information regarding vaccinations and travel health advice can be found by following the NHS and NaTHNaC links at Explore Travel Health and from your local healthcare provider. Visa and vaccination requirements are subject to change and should be confirmed by you before travelling.